One of the big mysteries in today's NHL is how a team with as much talent as the Tampa Bay Lightning can have such a useless (for lack of a better word) power play. While there's been some talk of the team's power play being fixed as a result of some "success" against the Detroit Red Wings, the reality is that this team still has a lot of work to do with its man-advantage unit. Obviously the small sample size makes the disparity far greater than it likely would be over time, but the fact remains that Tampa Bay has failed to generate shot attempts at the same rate as some of the teams they are competing against for hockey's biggest prize. It's just not a recipe for success if you're looking to score with the man advantage. He's not wrong. While the Lightning didn't generate a ton of high-danger scoring chances with the man advantage in that game, they threw the puck at the net with regularity. Isolating for Game Four, the Bolts averaged 156.3 shot attempts per 60 minutes of man-advantage action. 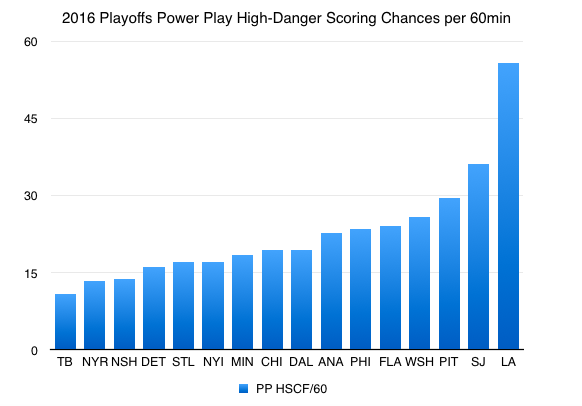 Compare that to the first chart in this blog and it's not hard to see why success found its way to Tampa in Game Four but hadn't/hasn't been there before or since. It sounds cliche but, more often than not, any shot towards the net is a good shot towards the net. Whatever the coaching staff went over with the guys before Game Four worked. It worked because they weren't afraid to put the puck on net. That needs to be the mentality each and every single time an opposing player heads to the sin bin. Use Game Four as a blueprint. 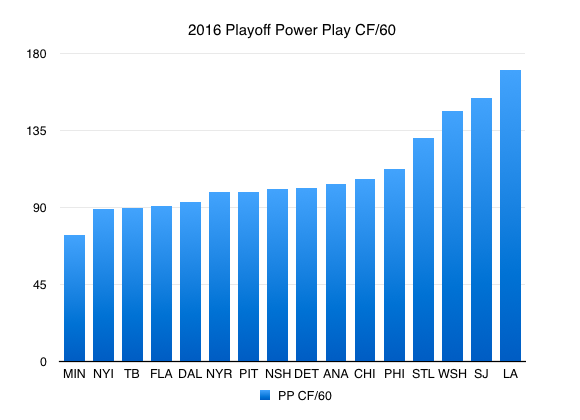 There's enough talent on this team to make an effective power play legitimately deadly. While there is indeed still work to be done, as shown above, the good news is that if the coach can get his guys to go back to what they were doing in Game Four, this Lightning squad could be in very good shape moving forward to the second round.